The St. John's Maple Leafs were an ice hockey team in the American Hockey League. They played in St. John's, Newfoundland and Labrador, Canada at Memorial Stadium from 1991 to 2001, and at Mile One Stadium from 2001 to 2005. While the AHL had a strong presence in Atlantic Canada in the 1980s and 1990s, largely due to the desire of several National Hockey League Canadian franchises to continue to pay players sent down to the minors in Canadian dollars, by 2004 St. John's was the last remaining team in the region prior to its relocation. The Leafs' AHL franchise was established in Moncton, New Brunswick, in 1978 as the New Brunswick Hawks, where they played until 1982. The franchise also had stops in St. Catharines, Ontario, as the St. Catharines Saints (1982–1986) and Newmarket, Ontario, as the Newmarket Saints (1986–1991). 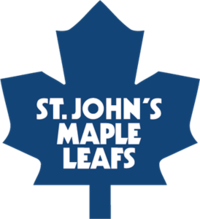 The St. John's Maple Leafs were established in 1991 when the Toronto Maple Leafs moved its AHL farm team to St. John's, becoming the first professional ice hockey team in Newfoundland and Labrador. The team played their home games at the Memorial Stadium until 2001, when they moved to the Mile One Centre, where they remained until becoming the Toronto Marlies. The Maple Leafs were very popular throughout their existence, and they made multiple appearances in the AHL Calder Cup playoffs (only missing the playoffs in 2000, 2003 and 2004). The team was in the Calder Cup finals in their inaugural season, losing 4–3 to the Adirondack Red Wings, but they won the semifinal round by earning the most points during the regular season out of the three remaining teams in the playoffs, the others being the Red Wings and the Rochester Americans. Their first season was the only time the team made it to the finals, and they never made it past the conference semi-finals round after that. They made subsequent appearances in the second round, losing 4–0 in 1993 to the eventual Calder Cup champion Cape Breton Oilers, and lost the second round in their remaining appearances, all of which were won by the conference champions for the season, losing 4–2 to the Moncton Hawks in 1994, 4–3 to the Hamilton Bulldogs in 1997, and 4–0 to the Bridgeport Sound Tigers in 2002. However, the team was the division champion for the 1992–93 and 1996–97 seasons, and won the regular season title for the 1993–94 AHL season. On April 29, 2005, the Maple Leafs played their final game, Game 5 of the division semi-finals round of the playoffs against the Manitoba Moose at the MTS Centre in Winnipeg, Manitoba, losing 4-0. This was one week after the Maple Leafs' final home game (Game 2 of the first round), a 6–1 victory over the Moose, which was to be their final victory. It officially marked the end of 34 consecutive seasons of the AHL's presence in Atlantic Canada, which began in 1971 with the Nova Scotia Voyageurs in Halifax, Nova Scotia. The parent Maple Leafs wanted to reduce travel costs; by the time of the AHL Leafs' final season in St. John's,their nearest opponent was the Portland Pirates, 1,781 km (1,107 mi) away. Additionally, the Maple Leafs had recently renovated Ricoh Coliseum for hockey use. These factors resulted in the team's relocation to Toronto for the 2005–06 season as the Toronto Marlies. In 2011, when the NHL's Atlanta Thrashers moved to become the second incarnation of the Winnipeg Jets, the Manitoba Moose moved to Newfoundland to become the St. John's IceCaps, becoming the first AHL team in Atlantic Canada in six years. Coincidentally making the final St. John's Maple Leafs game, one between the outgoing St. John's team and the future St. John's team. After the departure of the St. John's IceCaps in 2017, St. John's was awarded an ECHL team called the Newfoundland Growlers to begin play in the fall of 2018. The Growlers were later named the ECHL affiliate of the Toronto Maple Leafs and the Toronto Marlies, returning the Leafs presence to St. John's. 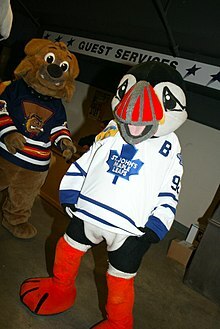 The team's mascot was Buddy the Puffin, an anthropomorphic puffin (the bird of Newfoundland and Labrador) wearing a Maple Leafs home jersey with the number #92 (to commemorate 1992, the year Buddy was introduced), who appeared at Maple Leafs home games in St. John's and numerous appearances at events across Newfoundland and Labrador. The puffin design of the mascot was selected as the winner in a fan contest to create a mascot for the team for its second season, and was officially given the name of "Buddy" just before the beginning of the 1992–93 season. Buddy was reintroduced as the mascot of the St. John's IceCaps on October 21, 2011, complete with an IceCaps home jersey; the jersey remains numbered #92. Games were broadcast on radio by VOCM (and by CJYQ in later seasons) and on television by Cable Atlantic's Cable 9 channel available on Cable Atlantic systems in Newfoundland and Labrador. Cable Atlantic was sold to Rogers Communications in 2001 by its owner, Danny Williams, before he became leader of the Progressive Conservative Party of Newfoundland and Labrador and later Premier from 2003 to 2010, and Cable 9 would become known as the Newfoundland and Labrador version of Rogers TV. ^ "Baby Buds move to Toronto". Retrieved 19 June 2012. This page was last edited on 9 January 2019, at 22:22 (UTC).